2:12 of Latin American dance rhythm. 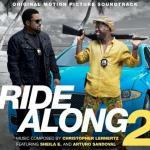 It is one of the major musical themes of this film – Ride Along 2, the description of the soundtrack to which you are now reading. In the middle of its short body, a melody changes with persistent notes of the piano, but later, in half a minute, transforms to be the former. Passionate, full of vitality, under which it would be desirable to go to the hot dance in the carnival night somewhere in Cuba, to taste the life to the fullest. We are sorry, but we don't yet have lyrics for that song.